Bangkok, Thailand: We decided to go in search of fabrics while in Bangkok and everyone pointed us towards Chinatown and Little India. The markets were filled with shark fins, tuk-tuks, good deals and of course, the requisite oddities. Look Ma, we got tattoos! Bangkok, Thailand: When visiting a new place, there’s always one market that everyone lauds ‘Go there, it’s awesome’ but rarely is it really that awesome. That is not the case with the Jatujak Market. This place is as cool as the Brooklyn Flea, but about 1000x bigger. We thought we’d spend a few hours visiting yesterday, but we loved it so much we came back today for even more. The JJ Market weighs in as the largest market in all of Thailand, covering 35 acres, with 15,000 stalls and 200,000 visitors each weekend day. On one hand, it felt strangely familiar as we meandered through the stalls lined with trucker caps, dodged retro tuk-tuks outfitted with artisan ice creams and rubbed shoulders with BKK hipsters sipping iced coffee. What was completely new, however, were squirrels on leashes, adolescent trannies, carts of fried insects, the mango lady who hocked her goods with both a question and a statement (Mango? Mango!) and our favorite – dried squid on hangers. Yum!! Bangkok, Thailand: As our time in Asia comes to a close, we decided to spend our last week in Bangkok. Our exhausting first day touched on the contrasts this city is known for: vibrant street life, religion & reform. We met up with Melissa’s NY-based friend Taleah who happens to be in Thailand at the same time. We hopped a water taxi down the Saen Saeb Canal with the locals, getting off where we saw some street tailors & interesting food stalls. Instead of immediately finding Wat Ratchanatdaram and Wat Pho as we’d hoped, we stumbled upon a demonstration site with an Olympic-sized television broadcasting political rhetoric and hundreds of protesters’ camp sites. We made our way through and were on to visit the reclining Buddha, a 130-foot gold marvel who appears blissfully unfazed by Bangkok’s sweltering heat. Afterward, we engaged in a lively cross-language argument with a long tail operator who couldn’t believe that No, we didn’t want an hour-long tour and instead hopped back on a water taxi to wind our way back to where we started. We’re exhausted, but captivated with being back in a city after so long. More to come as we experience the multitude of layers this city is known for. Koh Tao, Thailand: We spent 22 beautiful days swimming & snorkeling the turquoise waters of Jansom Bay. We loved the kindness of the Thai people who greeted us each morning with Sawadee Ka and a smile. We’ll miss the red sky sunsets and our nightly walks to fresh seafood and a cold Chang. Good night Koh Tao! Koh Tao, Thailand: Each day we head out into Jansom Bay and explore what’s under water. After the first few days of being captivated by the beaked coral fish, Christmas tree worms, Harlequin sweetlips, parrot fish, double barred rabbit fish, butterfly fish, long fin banner fish and pink skunk anemone fish, we decided to get an underwater camera case. While we’re not able to capture all of it for the blog, it’s pretty amazing to swim amongst this beautiful marine life. 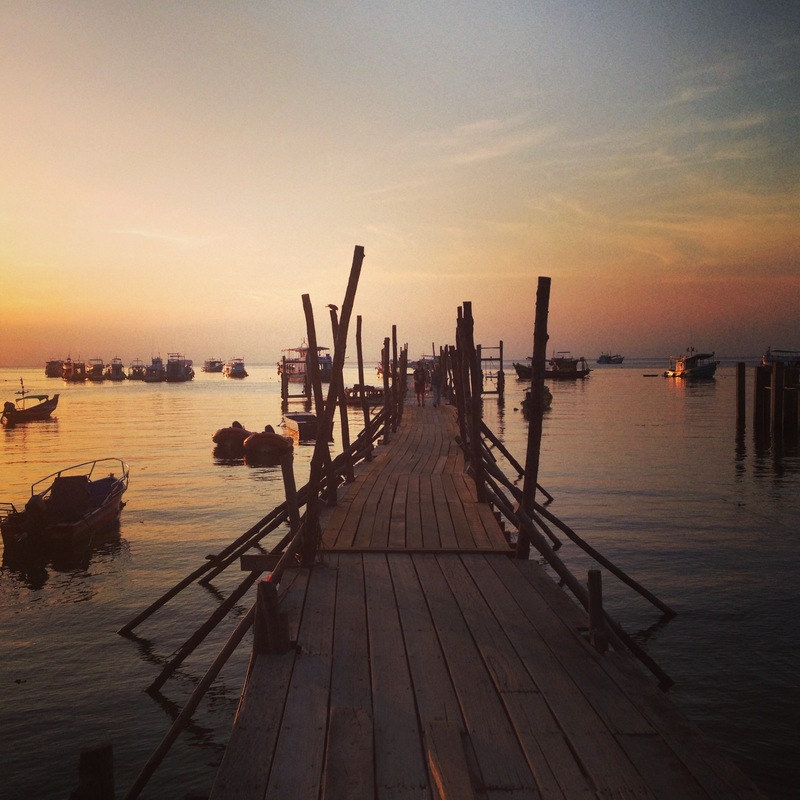 Koh Tao, Thailand: We loved our time in Bali, but we didn’t love Bali’s beaches. So, we set out to find the most beautiful, quiet & secluded spot in Thailand to call home for 3 weeks. Due to some fortunate circumstances (and persistence), we were upgraded to a cliffside bungalow that hangs over the Gulf of Thailand. Sunsets off our deck are spectacular, and we couldn’t be happier waking up to the quiet surf rolling over the boulders below.